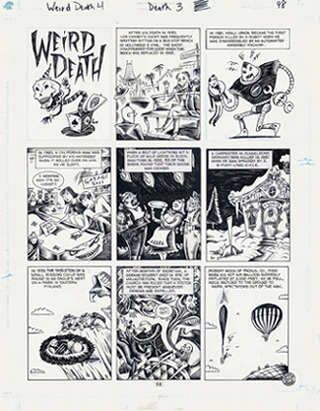 "Weird Death" one-page comic strip drawn for The Big Book of Death published by Piranha Press, 1995. Drawn on the official Piranha Press blueline paper, which was provided to all artists. Large (15"x18"). The lettering was done by someone on the PP staff and there are a few pasted-on corrections (all still firmly in place with no browning). There are a few small areas of white-out. Sorry that the scan is so small -- if you would like a better look at it, email me at richard@richardsala.com. Serious inquiries only please.